The tales of the Himalayan Pyramids or the Masrur Rock-Cut Temple in Kangra Valley are very interesting. A Nagara-styled monolithic memoir, meaning carved out from a single but colossal rock, the still incomplete temple complex, as if in a regal gesture stands atop on the steep rock ridge. The holy shrine with sculptures, meticulously carved, lying in and outside the temples is located on a strategic hilltop in the Kangra district of the Himachal Pradesh, the North-Indian state in the frontier of the Himalayas. Also dubbed as the Himalayan Pyramid, the temple complex embodying a total of 15 rock-cut temples in Indo-Aryan design, and few sculptures here and there, again monolithic in nature, of Hindu deities Ram and Sita, has most of it in ruins, reportedly damaged by the powerful 1905 seismic quake which rocked the entire district. The temple is dedicated to Lord Shiva who is believed to have set foot on this holy ground. Further entrance to the main shrine, ‘Garb-Griha’, leads through the especially ornate stone door, inside the shrine are black stone images of Lord Rama, Sita, and Laxmana. In the center though stands a figure of Shiva. Thus, this is what makes this ancient temple so sacred among the Hindu pilgrims. 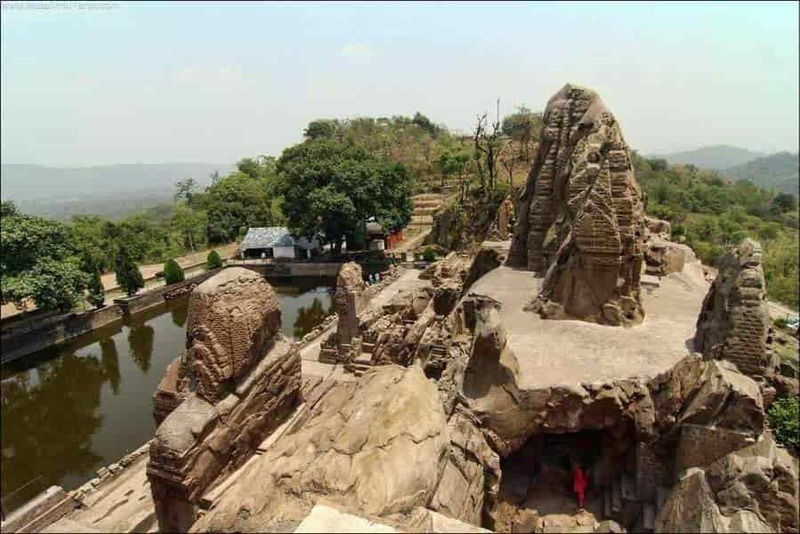 However, unlike the most Hindu temples, the central- Thakurwada shrine doesn’t face the east, rather towards the north-east facing the snowy Himalayan peaks of the Dhauladhar range. All temples are covered with intricate stone carvings meticulously sculptured out of the rock, though most of it is in ruins. However, the most elaborate carvings adorning Thakurdwara are still in existence and doesn’t fail to amaze any fellow traveler. Moreover, the temple complex also houses a rectangular water body more like a pool in the premises of the temple, adding to its already regal stature. The 15 temples form a cluster, a complex of shrines, or at least appears that way with a larger temple – Thakurdwara shrine in the centre, that specific name being assigned to the central temple after Harold Hargreaves, a British Indian archaeologist who served as Director General of the Archaeological Survey of India (ASI) visited the temple in the year 1913. Rather than a cluster of separate shrines, it, in fact, is an integrated shrine with 14 temples cut only from the outside, but Thakurdwara – also from the inside. The temple as it is constructed, free-standing Nagara-styled structures with characteristic beehive formed towers cut from live stone are rare existence, not just in the Himalayas or in India but is peculiar to the entire world. The only two other comparable shrines to the erstwhile are the rock-cut temples in the northern part of India, the Dharmanath temple near Dhamnar in Rajasthan and Thal temple in Uttar Pradesh. This very fact has led to the elevated, rather regal stature of the temple among art historians. The temple complex is a real riddle for historians and archeologists, resulting from lack of any inscriptional mention of patronage or period of the construction of the temple complex, no credible date can be transfixed to as when the temple was constructed. However, taking into account the regional political and art history, it is believed to have been constructed in the first half of the 8th Century. Also, the temple complex is attributed to some unknown rulers of ancient Jalandhara kingdom in the plains of modern Punjab who continued to rule the Kingdom up until the 12th Century. The anonymity of the patronage is no great an issue, the local legends have a different take on it. As the stories have it, the Pandavas of Mahabharata fame resided here during their “incognito” exile from their kingdom, they were exiled for thirteen years-twelve years to be spent in the forest and the thirteenth as incognito, and built this temple. Subsequently, when their identity and location was exposed, so they shifted from here. Many even speculate this to be the reason why temple complex was left unfinished. It is also said that, sometime in the 20th century, someone introduced three small Blackstone statues inside the shrine which faces east. These are of Rama, Lakshmana, and Sita of the Ramayana fame. Though the Local people in Kangra Valley, of course, knew about these amazing structures from time immemorial, the astounding shrine came into limelight only after1875 European archeologists learned about the temple complex. Though in ruins, in the last few decades it has become a popular tourist attraction, with mostly religious tourists joining the frenzy.